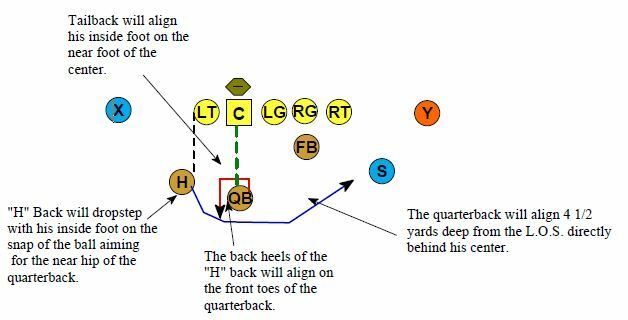 The success of the Single Wing offense utilizing the full spin by the quarterback depends on his ability to conceal the ball fake, and momentarily freeze and confusing the defense as to which back has the ball and where the point of attack will be. The quarterback assumes his two point stance 4 1/2 yards off the ball, with his inside foot always splitting the crouch of the nearest guard located next to the center. The spin should be one complete, smooth, rhythmic move. The quarterback receives the gun snap from center with both hands just above his inside knee. As the quarterback receives the ball he simultaneously takes a short 8 to 10 inch step with the outside foot forwards, placing all his weight on the ball of his foot and making a complete full spin by bringing the inside foot behind him and stopping only when the inside foot is in the position to step into the play hole called in the huddle. The spin is accomplished with the legs bent and the waist down with the quarterbacks back fairly erect, with shoulders square and the body in full control, ready to hand-off to either his “H” Back or Slot Back or Buck Lateral that requires him to hand the ball off to his Fullback. Immediately upon receiving the ball from the center he will bring the ball up through his third hand (belly button) as he starts to spin. At the 1/4 mark of the quarterbacks spin and with his back screening off the callside of the defense he should be ready to hand the ball off to the Tailback with the hand furthest from the Tailback; as the quarterback continues his spin at the 3/4 position, when his back is now screening off the backside of the defense, he should be ready to now hand-off to the Slot Back if the play calls for the hand-off to him. Continuing his spin the quarterback will have done a 360 degree pivot on the ball of his outside foot and now is ready to step into the offensive hole called with his inside foot, with or without the ball, depending on whether he handed it off or kept it. As the quarterback steps into the offensive hole called he should be in a relatively wide stance, with both arms and upper body over the ball and under full control. Remember, the footwork with slight adjustments depends on the point of attack. The Fullback spin in this manual is alerted by attaching the alert words “Buck Lateral”. With mastered timing and great fakes by the quarterback, Tailback, and Flanker, this can raise havoc with the defense. The mechanics of the quarterback is exactly the same as his technique when keeping the ball after faking to either the “H” Back or Slot Back. Upon receiving the snap from center, the quarterback immediately brings the ball up through his third hand (belly button), with arms folded parallel over the belly of the ball and palms of the hands covering the ends of the ball, so as to fully conceal it from the defense. The quarterbacks upper body remains fairly erect to allow both the “H” Back and Slot Back to run their offensive paths as close to the quarterback as possible without bumping or allowing “daylight” in the fake hand-off. As soon as the Flanker has passed him at the 3/4 mark of his spin the quarterback bends his upper body over the ball, continues the spin to the point where he is facing the line of scrimmage, and steps with his inside foot at the near hip of the fullback. As the quarterback moves forward and approaches the fullback, who has done a half pivot in place and is low, with his back facing the defense, the quarterback either keeps or hands off, slipping the ball with the outside hand nearest the fullback. The Buck Lateral series provides an additional dimension to the single wing offensive attack and adds to the time the defense has to prepare for you. Upon the snap of the ball, the fullback pivots on his outside foot bringing the inside foot around behind him or half spins in a low, square position, staying in the same spot but now facing the quarterback as he approaches the line of scrimmage. The fullback elevates his inside arm shoulder height, with the forearm parallel to the ground; his outside arm assumes the same position across the midsection forming a big pocket for a hand-off from the quarterback. if the hand-off is made, then the fullback has several options such as running, pitching, handing off, or passing the ball. If the fullback runs with the ball, he must belly back, get behind his blockers and running to his designated hole. If the fullback pitches or laterals of to his Tailback, he steps with his outside foot toward the back to whom he is pitching the ball, and then leads the ball carrier up field. When handing off to the Slot Back, it is his responsibility to firmly place the ball with his inside hand into the midsection of the flanker and the rolls out wide to the tight side carrying out a good fake. When there is no exchange between the quarterback and the fullback, it is important that the fullback goes through one of the previous mentioned maneuvers (run or pitch), faking and deceiving the defense as to the path of the ball carrier. The “H” Back will always assume the same two point stance that he would assume with all formations mentioned, with both hands resting comfortably just above the knees, weight over the balls of the feet, and eyes focused on the ball. Proper spacing between the “H” and Quarterback is very important. The Tailback should always keep his shoulders parallel to the line of scrimmage, his inside foot always aligning on the near foot of the center and his heels aligned on the insteps of the quarterback. On the snap of the ball from the center, the “H” Back takes a drop step with his inside foot directly at the near hip of the quarterback and elevates his outside forearm shoulder height and his inside forearm just below waist level, forming a big “pocket” for a hand-off or fake hand-off from the quarterback. The path of the “H” Back is parallel to the line of scrimmage, and no daylight is exposed between the two backs whether or not an exchange is made. The point at which the quarterback and tailback come together for the exchange or fake exchange is always at the same point of the spin. This is when the quarterback has his back to the tight side of the defense, concealing vision of the ball. At this point, the tailback bends at the waist, drops his inside shoulder slightly, and collapses his inside forearm to the waistline so as to completely cover-up the hand-off or fake hand-off. The tailback should run low, with his upper body bent abd his legs slightly apart ready to cut and drive off his outside foot, setting up blocks for the fullback and pulling linmen. Whether or not an exchange is made, carrying out the fake until the play is officially blown dead is of utmost importance. The faking of the backs is as essential to the success of the play as the ball carrier’s roll and must be done to the fullest at all times. It is the responsibility of the quarterback to firmly place the ball with the backside hand into the midsection of the tailback when an exchange or hand-off is made. It should be a very closely knit and deceptive maneuver, with no reaching involved by either back. The Slot Back) should be a player of versatility. The Slot Back must be able to block for tightside plays, carry the ball for openside plays, and possess the ability to get into pass routes and catch the ball. This position is very flexible in that the back can be set in motion or flanked wide as a wide receiver and still be very effective in running most basic plays. Normally, the Slot Back assumes the same stance as the rest of his backfield, one yard outside the tightside tackle, and his depth off the ball is such that his head is on the tailbone of the fullback or about 2 1/2 yards deep. 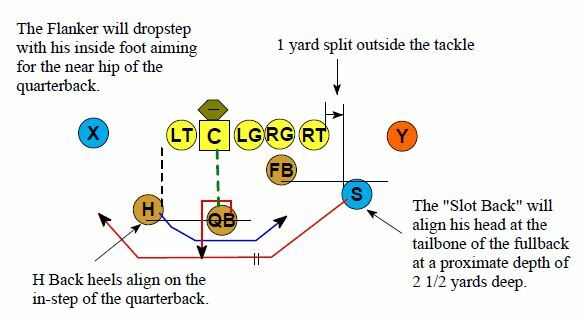 The mechanics of the Slot Back on openside plays or opposite plays in which a hand-off or hand-off fake from the quarterback is involved are as follows; the initial move of the flanker upon the snap of the ball by the center is an open step on the inside foot, slightly back from the line of scrimmage, directly at the near hip of the quarterback. As the Slot Back approaches, with the quarterback at the three quarter mark of his spin and his back obscuring the vision of the open side of the defense, the flanker elevates his inside forearm at shoulder height and his forearm just below waist level, forming a big pocket for an exchange or fake hand-off by the quarterback. Now the flanker bends at the waist, drops his inside shoulder slightly, and collapses his right forearm to his waistline so as to completely cover up an exchange or fake. The Slot Back should run low, with a wide base, cutting off the outside foot into the designated hole.